We love working with artists. In challenging the status quo, they bring some truly fascinating and diverse work our way. Who better to push the boundaries of 3D printing’s materials and applications? So far this year, we’ve been lucky enough to work with Michael Eden, Paul Bonomini, Matthew Plummer-Fernandez and now Jam Sutton. 3D printing has given rise to a completely different medium through which artists can express their concepts. It offers unparalleled opportunities for experimenting with geometry, scale, pattern and repetition. It’s great to see the art world embrace this digital medium with such relish! This month we’ve produced a sculpture for artist Jam Sutton in support of the ‘On a Pedestal’ exhibition at Dublin Castle. 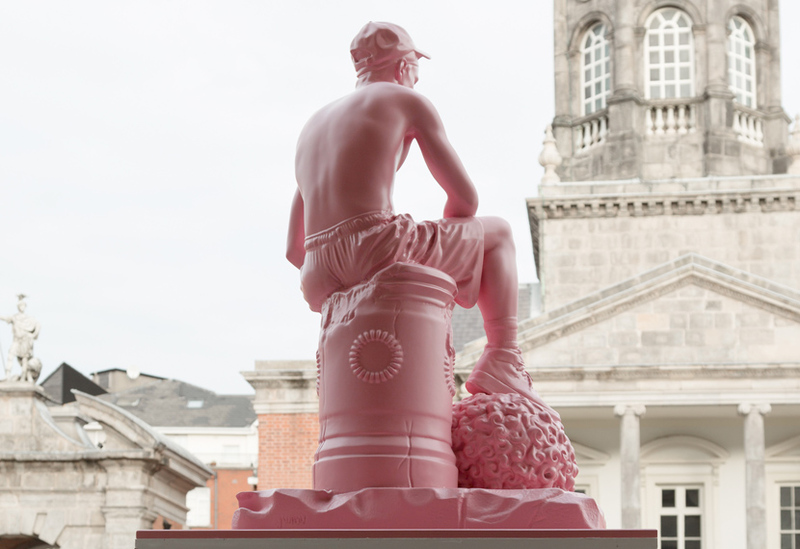 The exhibition, which started out at Castletown House, brings together works from an international group of contemporary artists who explore the genre of the portrait bust in a variety of media: from wood to stone, from marble to ceramics, from stainless steel to more ephemeral materials such as sugar. Jam asked us to print an enlarged copy of his original David & Goliath sculpture, created in marble. 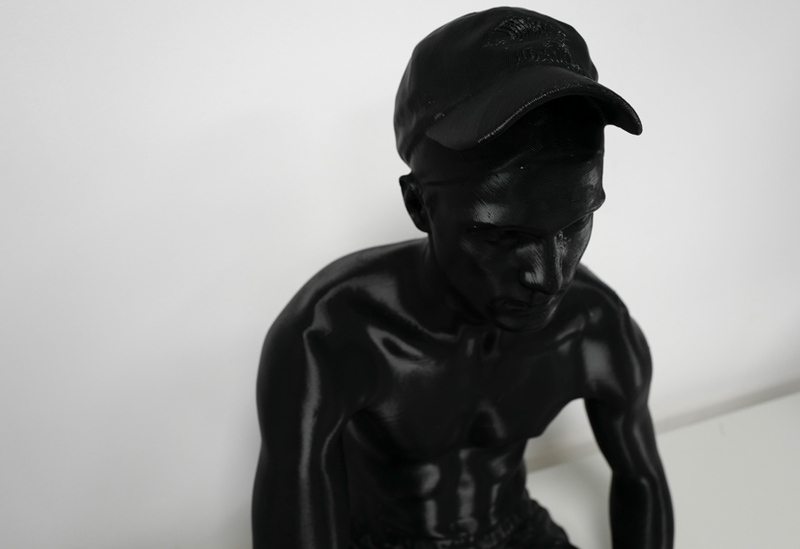 With durability and detail both a priority, we printed the sculpture on our Fortus 900mc. This machine enables us to achieve excellent detail on a large scale whilst using a heavy-duty material. 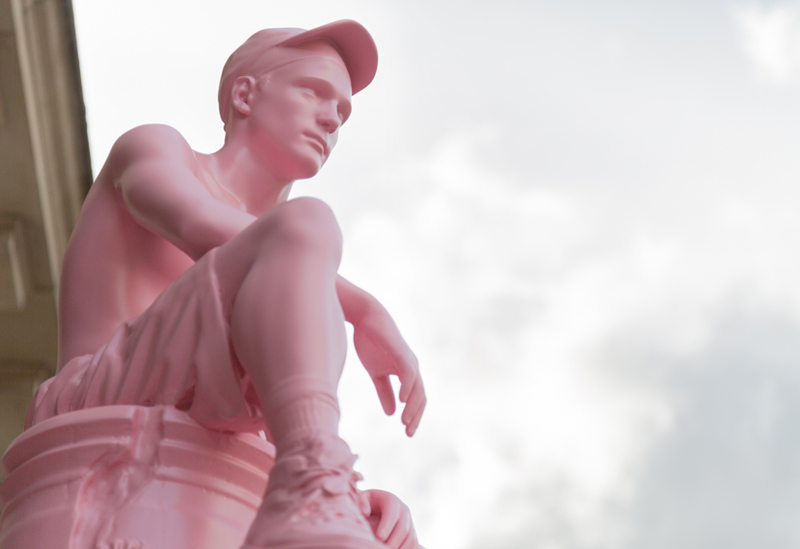 The sculpture was printed in three parts taking a total of 258 hours to print. Once completed, our finishing team sanded out any imperfections, primed it and finally sprayed it with bubble-gum pink paint, a signature colour often used by Jam in his artwork. 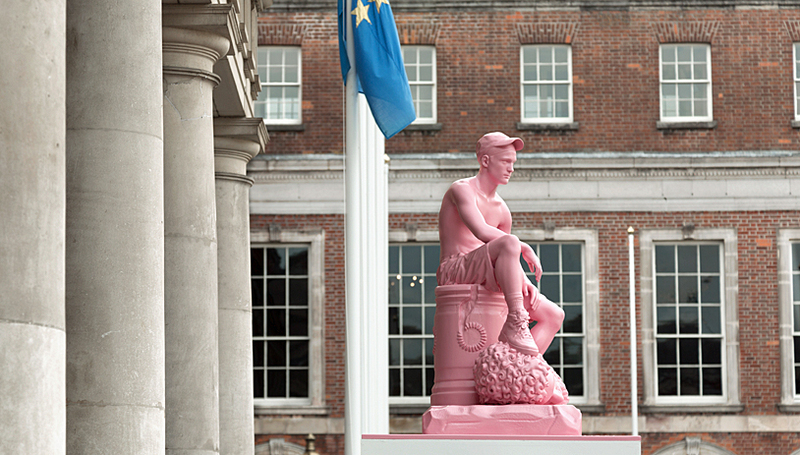 The piece was displayed in the courtyard of Dublin Castle, guiding visitors to the main ‘On a Pedestal’ exhibition. The exhibition itself closed on 4th November but Jam’s large-format 3D printed sculpture will be on display at Dublin Castle right through the winter. 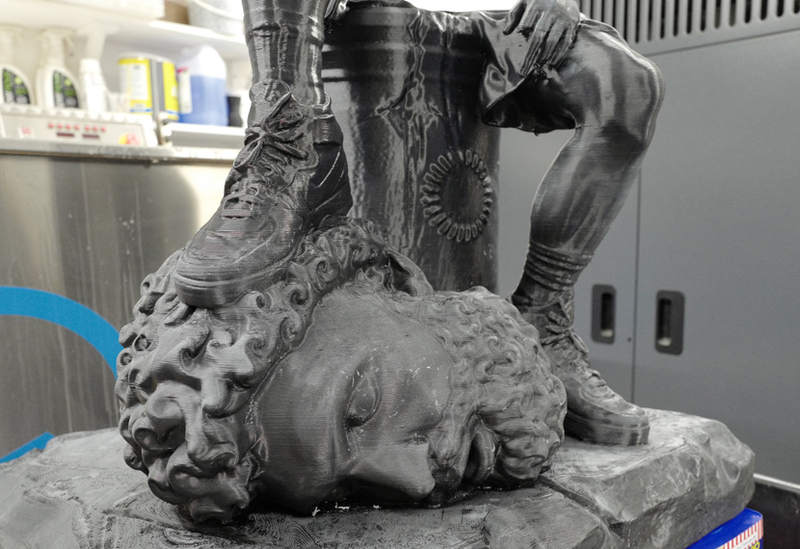 Printed on our Fortus 900mc, the sculpture was smoothed, prior to painting. Our Fortus 900mc achieved fantastic detail, at scale and in a durable print medium. After priming, the sculpture underwent fine sanding in our Finishing Department. Adding final finishing touches to the ‘bubblegum pink’ paint finish. Boxed in preparation for shipping. In-situ outside Dublin Castle’s ‘On a Pedestal’ exhibition.